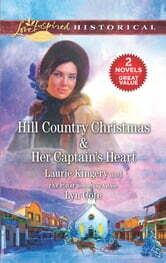 In the rugged Texas Hill Country, Delia Keller went from penniless preacher’s granddaughter to rich young heiress. She’s determined to use her money to find the security she’s always lacked, and build herself a new house by Christmas. Former Civil War chaplain Jude Tucker longs to show her what true Christmas joy means. Can he restore his own faith and give Delia his love for all seasons?